I started reading Adam Greenfield’s new book, Against the Smart City, with the expectation that it would be a critical view of the ways our urban lives have changed during the past half decade with the massive adoption of so-called “smart phones” and the rest of the ubiquitous technosphere. But it turns out he has a rather different target in mind. His polemic, delivered by EPUB and kindle only (so far), is directed at a techno-utopian fantasy promulgated by large multinational corporations and their government client-sponsors. 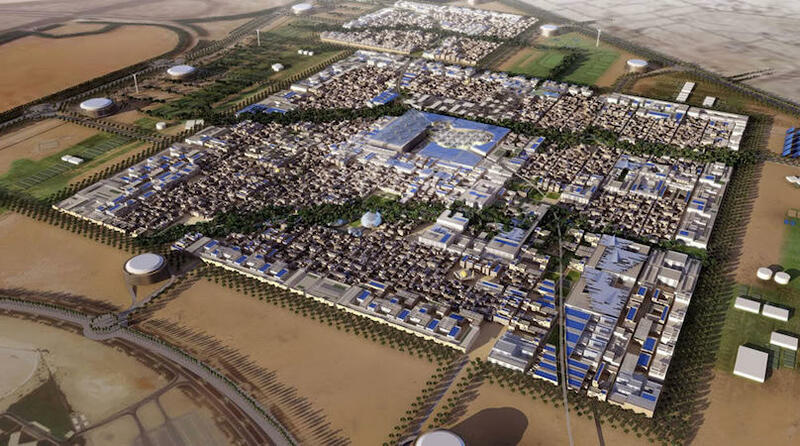 Pictured above: A rendering of Masdar City, a “smart city” in the United Arab Emirates. By Forgemind ArchiMedia under a Creative Commons license from Flickr.com. The three big corporations at the heart of this below-the-radar industrial fantasy are IBM, Cisco Systems, and Siemens AG (of Munich, Germany). These companies are very familiar with large-scale projects and like to imagine they are capable of re-engineering life itself (IBM’s hubris-filled slogan these days is “let’s make a smarter planet”). 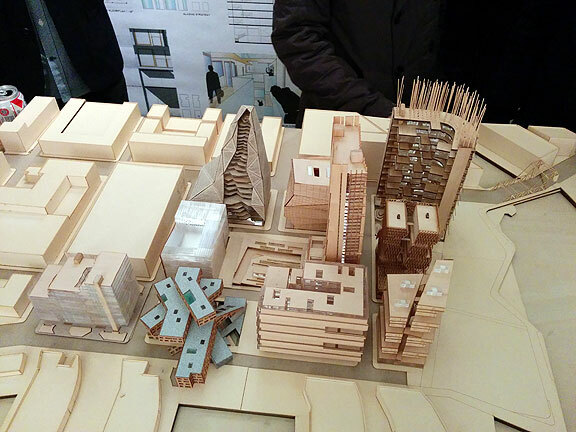 They have all brought software- and hardware-linked systems to the market, offering urban planners a turnkey “solution” for everything that faces a generic municipal government. As Greenfield ably shows, the rhetoric, vision, and reality of these corporate schemes depends on an alarming amnesia and disregard for both history and actual knowledge about how cities really function. We act in historical space and time, as do the technological systems we devise and enlist as our surrogates and extensions. So when Siemens talks about a city’s autonomous systems acting on “perfect knowledge” of residents’ habits and behaviors, what they are suggesting in the first place is that everything those residents ever do — whether in public or in spaces and settings formerly thought of as private — can be sensed accurately, raised to the network without loss, and submitted to the consideration of some system capable of interpreting it appropriately. And furthermore, that all of these efforts can somehow, by means unspecified, avoid being skewed by the entropy, error and contingency that mark everything else that transpires inside history. Soon after plunging into Against the Smart City I began to wonder why so much analytical effort had been spent debunking what seem to me to be patently absurd assertions by corporate PR departments. While I appreciate Greenfield’s detailed rebuttals to the Smart City propagandists, I found myself bogging down. I can’t really believe these plans are being built or will ever come anywhere near to their claims. Greenfield’s critique leaves little room for anyone to suggest that these “smart city” plans are anything but self-evidently ridiculous. For all of the conceptual flaws we’ve identified in the Siemens proposition, though, it’s the word “goal” that just leaps off the page. In all my thinking about cities, it has frankly never occurred to me to assert that cities have goals. (What is Cleveland’s goal? Karachi’s? )…By failing to account for the situation of technological devices inside historical space and time, the diversity and complexity of the urban ecology, the reality of politics or, most puzzlingly of all, the “normal accidents” all complex systems are subject to, Siemens’ vision of cities perfectly regulated by autonomous smart systems thoroughly disqualifies itself. 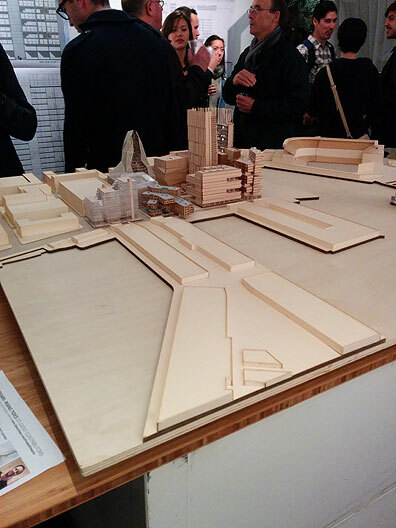 But it’s in this depiction of a city as an entity with unitary goals that it comes closest to self-parody. The frenzy of construction and upward growth continues unabated in San Francisco while we all await the next, inevitable crash. Appear[s] to allocate commercial, residential and retail sectors around a central public space, in a radial scheme as inelastic as Disneyland’s…The city’s functions are dispersed among discrete Retail, Residential, Research and Entertainment quarters, there to remain…the strict functional segregation of activity into designated, single-purpose districts is a hallmark of high-modernist urban planning, finding its earliest pure expression in Le Corbusier’s unbuilt Plan Voisin of 1924 and reaching an apotheosis in post-war plans like those for Brasília and Chandigarh. The capital city of Manchuko, known in Japanese as Shinkyo or New Capital, was little more than a small railway junction called Changchun when the Japanese set up the puppet state in 1932. Almost at once teams of Japanese planners, engineers, architects, and bureaucrats of the South Manchurian Railway and the Kwantung Army set out to design the most modern, most efficient, cleanest, most orderly city in Asia, to be built in the “New Asian” style…On the flat northern Chinese landscape, covered in snow all winter, a brand-new city arose in five years of high-speed construction under the auspices of the State Council of Manchuko. If Albert Speer had been Japanese this would have been his monument to totalitarian planning: grandiose bureaucratic fortresses in the New Asian style flanking wide and perfectly straight boulevards leading to massive round plazas like the spokes of a giant wheel. 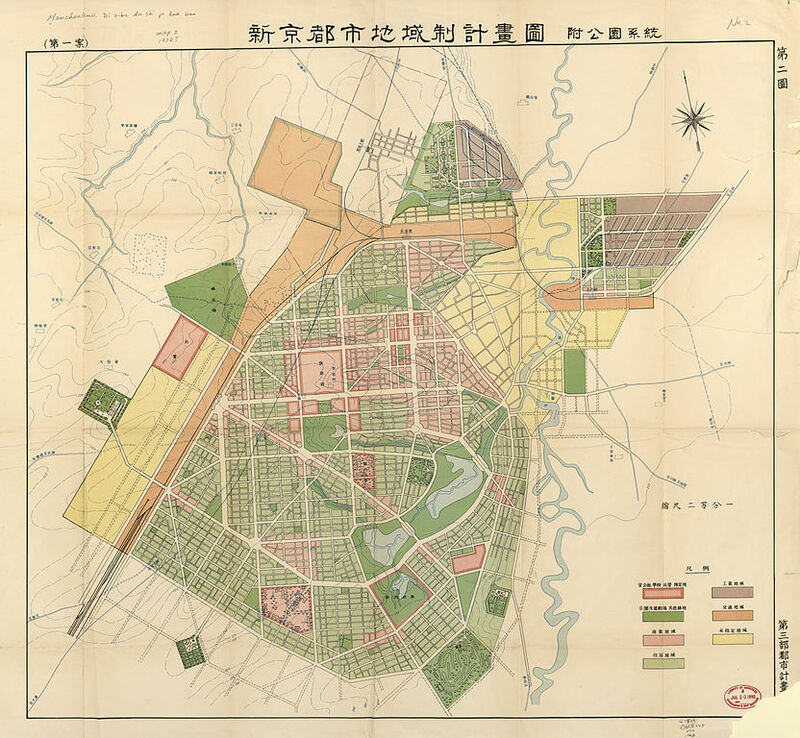 1932 early plan for Japanese capital of puppet state of Manchuko in northeastern China. Utopians of the 18th and 19th centuries, from Robert Montgomery and Claude-Nicolas Ledoux to Charles Fourier and Robert Owen, all imagined ways to design utopian towns and villages. They sought to engineer human society in a way that would lead automatically to prosperity and happiness for all. Early urban planners pursuing these visions separated various activities into different sectors, much like the plans for the Portuguese PlanIT Valley. Even the 20th century modernist architecture of Le Corbusier was originally meant to satisfy needs for a new working class housing that would also facilitate social goals such as community, hygiene, efficiency, and more. So the claims of Smart City advocates turn out to be modern reformulations of very old fantasies. Very little in the published PlanIT Valley or Masdar plans — or in Songdo, of what has actually been built — appears to respond to the collective insight we already possess regarding how urban space actually works, a line of thought so well developed that it has become conventional wisdom over the last half-century of urbanist discourse. 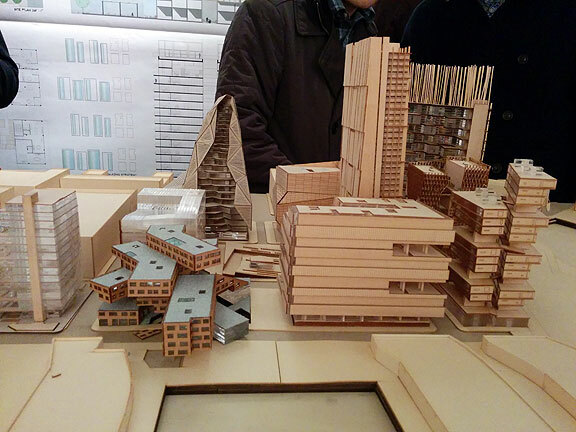 And that line of thought suggests that cities work best when they support a lively mix of uses. Perhaps tech firms have added a new wrinkle that they think gives them more credibility: the notion of transparent information. But drill down into the actual contracts and plans and you discover that the data collection that the whole Smart City scheme depends on is far from neutral. Mystification of “the data” goes unremarked upon and unchallenged not merely in IBM’s material but in the overwhelming majority of discussions of the smart city. But different values for air pollution in a given location can be produced by varying the height at which a sensor is mounted by a few meters. Perceptions of risk in a neighborhood can be transformed by altering the taxonomy used to classify reported crimes ever so slightly. And anyone who’s ever worked in opinion polling knows how sensitive the results are to the precise wording of a survey. The fact is that the data is never “just” the data. It’s hard to believe that anyone in the world is actually advocating for technological efficiency in 2014 as the primary way to evaluate the social good, whether urban or otherwise. Most technical people show more humility when it comes to their own work, realizing as they must that things fail more often than anyone expects, and the human errors embedded in sophisticated technical systems frequently undermine their optimal functioning. But the assumption that human life should be subjected to a standard of technical efficiency is the root of the problem. The persistence of the idea that a polity is something that can and ought to be managed like either a technical system or a commercial enterprise is hard to explain. Flawed at its very root, it betrays, at best, a shallow understanding of the mechanisms by way of which a city learns, diagnoses and repairs itself, utterly failing to account for the qualities which underlie love of place. A city whose interwoven processes actually were “regulated and controlled” as anticipated in this literature — where all the key performance indicators of superficial function were perpetually maintained within some nominal interval by computational oversight and not one thing allowed to interrupt the drive toward total efficiency — would not be a terribly healthy or a pleasant place to live. The reality of city life, self-evident to anyone on casual reflection, is that it is a place that depends on countless interactions that go unmeasured and unremunerated. Our lives are based on profound and widespread cooperation and mutual aid, most of which we take for granted. None of these normal activities that go on all day between people in cities is accounted for in the gee-whiz techno-utopianism of the Smart City propagandists. The presence in a city of technologies of ubiquitous data capture…is likely to suppress or displace activities…such [as]…provisions for housing and self-care, and community arbitration and dispute-resolution processes generally grouped under the anodyne label of “the informal sector.” They account for an astoundingly high percentage of total economic activity. They are critical to more recognized economic and social processes, even in what we are pleased to think of as the developed world. And they are entirely absent from the smart city’s account of itself…For me, the deepest truth of all about the smart city is bound up in that particularly infelicitous phrase from Living PlanIT’s material, “occupant support and convenience systems.” Every dive bar and every farmers’ market, every playground or cinematheque or Michelin-starred restaurant, all the bodegas, bike shops and edgy boutiques, the rib shacks and fetish clubs and flower festivals — all of that, and everything implied by them, Living PlanIT reduces to those five fatal words. This mockup is from a student studio presentation last week at David Baker’s Storefront Lab on Shotwell Street in San Francisco. It depicts building designs prepared for the Seawall Lot 337 across Mission Creek from the Giants ballpark, and adjacent to Pier 50 (which in turn has subsumed the original Mission Rock,once far out in the bay). 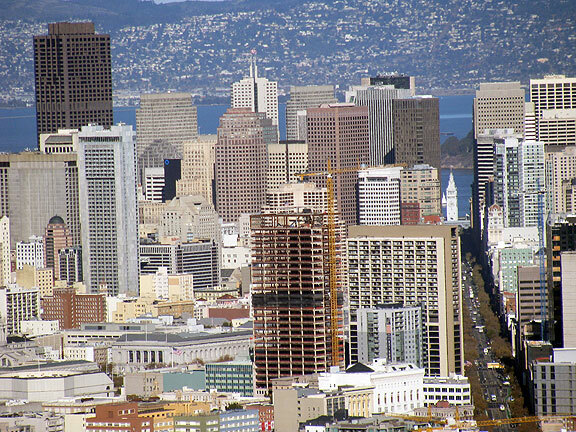 It is possible that the master developer here, the SF Giants, will opt for some version of these highrise plans for their new residential and retail “village” they are proposing to build. I actually like some of these designs, though would prefer to imagine them anywhere else but along the shoreline. The smart city as we see it instantiated in places like Songdo may well have died aborning. Yet so much of what was intended for it has already passed unexamined into the assumptions enterprises like IBM and Cisco and Siemens make when they propose informatic systems for other, realer cities. What happens on the receiving end, inside the municipal bodies that constitute the primary presumptive audience for such a marketing campaign? Low-level bureaucrats, pressed for time and starved for insight, stumble onto this thicket of conversation via a cursory keyword search; they copy-and-paste a few lines from the first reasonably credible-looking search result into their PowerPoint slides, unmodified; and these slides then get submitted up the hierarchy. The language propagates across the institution — and, what’s more, it meshes with that found in the hurriedly-downloaded white papers on the subject that someone found on the website of a name-brand management consultancy. The savvier staffers start to feel confident using these terms: speaking in them, thinking in them. While misgivings may in fact be prevalent, there are likely to be relatively few in the bureaucracy who are able to express them forthrightly — that is to say, who are sufficiently comfortable with the technology to understand precisely what is being proposed, familiar with the way their city works to convincingly articulate why this is problematic, assured of their own position to feel safe in doing so and passionate about the issue to willingly shoulder the risk involved. (If, as the saying has it, nobody ever got fired for buying IBM, it’s also the case that one may find oneself on shaky ground contradicting something printed straight from the IBM website.) When finally pressed to make a recommendation as to how the city’s resources should be allocated, the easiest thing for a committee member to do is go with the flow, or to at least outwardly agree with the person at the table who seems to know what they’re talking about, simply to bring the drawn-out process of decisionmaking to a close. This, in broad outline, is how a premature and preemptive consensus formed around the desirability of something called the smart city…To be precise, it’s almost exclusively a discourse about the instrumentation of the urban fabric and the quantification of municipal processes, specifically for ease and efficiency of management…In the end, this is why I believe it’s worth focusing a considerable amount of attention on the notionally temporary language of websites and interviews and expo stands. Quite simply, this rhetoric does work in the world. It sets agendas, influences perceptions of what it means to be “advanced,” recalibrates norms and guides the allocation of resources. How might we use networked technologies to further the prerogatives so notably absent from the smart-city paradigm, particularly those having to do with solidarity, mutuality and collective action? How might we inscribe a robust conception of the right to the city in all of the technological interventions proposed, including but not limited to those intended to enhance personal mobility, citizen engagement and processes of (individual and collective) self-determination? And what alternative conceptions of technology in the urban everyday might support the open, tolerant, feisty, opinionated character we associate with big-city life, above all that quality variously described as canniness, nous or savoir faire? Well? Let’s get on with these real debates, and leave the empty puffery of public relations in the dustbin where it should be properly resting. February 3rd, 2014 | Category: Book Reviews, Public Space, Technology? 3 comments to Agin the Smaht Cit-ay! In 1952 Mel Johnson presented investors with his idea of a perfect city—one built on booze. Every street would be a reference to alcohol, and they would even have their own currency called BoozeBucks. There would be a local police system, the Party Police. They wouldn’t arrest people — they would be more like roaming caretakers, giving drunks aspirin and kindly escorting them home when they got lost. Most importantly, no children would be allowed in BoozeTown. Visitors with kids could leave them at the daycare/summer camp area outside the city. When completed, the city would have had moving sidewalks, breweries, distilleries, permanent housing, and even suburbs. Perhaps unsurprisingly, Johnson could never get funding for BoozeTown and have up on the idea in 1960. Still, it sounds like BoozeTown may have inadvertently inspired many virtual game worlds that have their own currencies, like WoW Gold, and (let’s face it) exist only to get people wasted.